I always advocate that children should eat a healthy, balanced diet. But during special occasions like Halloween, it can often be hard to offer healthy choices! We also need to be careful not to demonize certain foods and ensure that candy and sugar become ‘sometimes foods’ rather than being banned altogether. Don’t panic though, I’m here to show you that healthy can still be delicious and with a few simple swaps, creative recipes and fun presentation ideas so the whole family can have a fun Halloween without those scary sugar highs and the hidden nasties. * Allow your children to choose two to three pieces of candy, chocolate or sweets and then offer them something exciting in exchange for the rest of their treats. * Avoid trick or treating on an empty stomach. Don’t send your kids out hungry because they’ll be more inclined to binge on their loot. 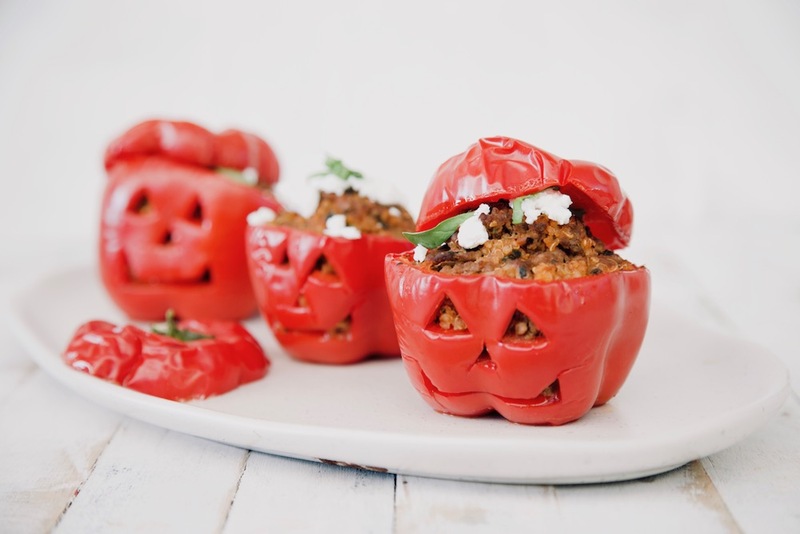 Put a Halloween twist on an old favorite like stuffed bell peppers for dinner before you hit the road. They’re a quick and easy dinner to whip up and your kids will love stuffing their very own spooky dinner. * Keep them hydrated. Thirst can be mistaken for hunger and thirsty kids will also be more inclined to drink sugary soda and fruit juices. * Have healthier treats on hand. 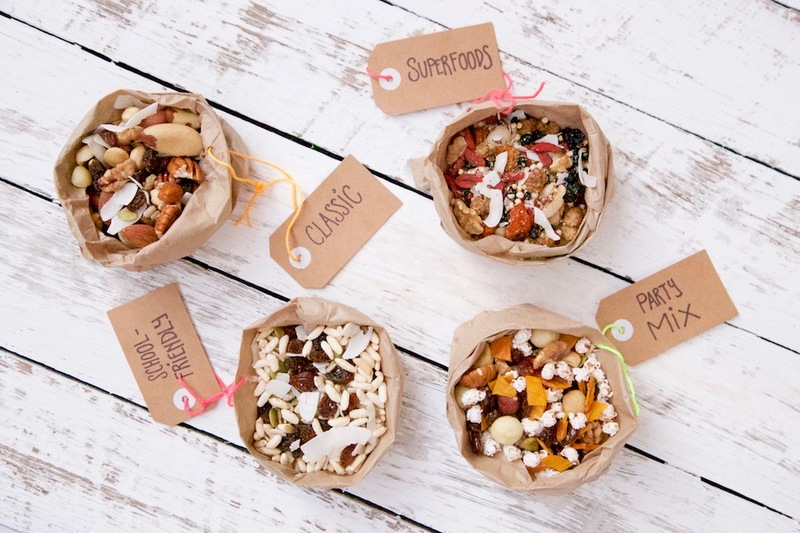 Fill their loot bags with healthier treats such as dark chocolate buttons, nuts dipped in chocolate, raisins or sultanas dipped in chocolate, gingerbread men, mini trail mixes with chocolate buds or popcorn. * Pick the best of the worst. If your child is determined to munch on all of their Halloween treats then choose mini size varieties such as mini chocolates over full-size chocolate bars. Opt for choices that contain identifiable ‘real’ ingredients, such as peanut M&M’s (the peanuts contain protein which helps to increase satiety) over chocolate M&M’s. Wherever possible, aim to avoid brightly colored snakes or gummy bears, which are a combination of artificial flavorings, colorings and sugar that can be gobbled up in seconds. * Homemade goodies. 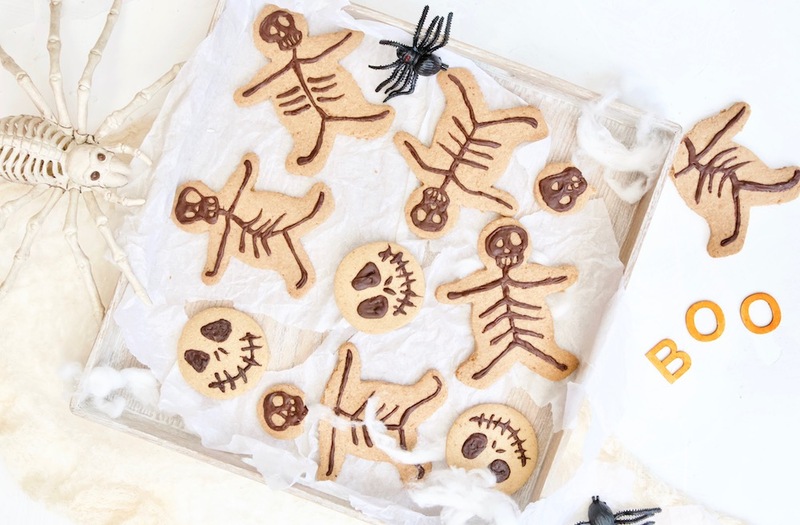 If you have the time, be prepared with simple homemade treats such as delicious Spooky Spelt Biscuits, Chocolate Quinoa Crackles, Halloween Pumpkin and Cinnamon Biscuits, Choc Chia Spider Pops and Choc Doughnut Witches Fingers which you can find in the Wholesome Child book. * Offer real food alternatives to candy, such as peanut butter sandwiches, mini pizzas, homemade scrolls or cut-up fresh fruit and veggie sticks. Sometimes just presenting food in a fun and ghoulish way can make all the difference. * If you’re entertaining this Halloween you might consider a Halloween themed cake rather than providing an array of sweets. You can say goodbye to the Halloween sugar rush and hello to healthy with this Marble Cake topped off with spooky banana ghosts! This delicious dessert will fill all the hungry tums, and be a feast for your eyes too!